Clover mites are tiny, reddish-brown arachnids that often appear by the thousands in homes, crawling around windows and many other areas. They are most abundant in the spring but can be found during other months of the year. Clover mites are readily distinguished from other mites commonly found around homes by their front legs, which are as long as their bodies. They do not bite humans or pets nor cause any damage but are extremely annoying, both by their presence and the red stain that they leave when crushed. Clover mites feed by sucking juice from plants. They attack a number of grasses and many cultivated plants and weeds growing around homes. They are most numerous in newly established lawns and in old lawns where there is a heavy growth of succulent, well-fertilized grass. The mites spend most of the year on plants outdoors. As cooler days appear in the fall, the mites begin to migrate to protective cover and often crawl up the sides of buildings to be in the sun. For this reason, they are usually found on the sunny sides of buildings. When cold weather arrives, the mites go into hibernation in protected places under bark, debris, in foundation crevices, around and in the frames and channels of windows, behind clapboards, shingles, in wall spaces, etc. 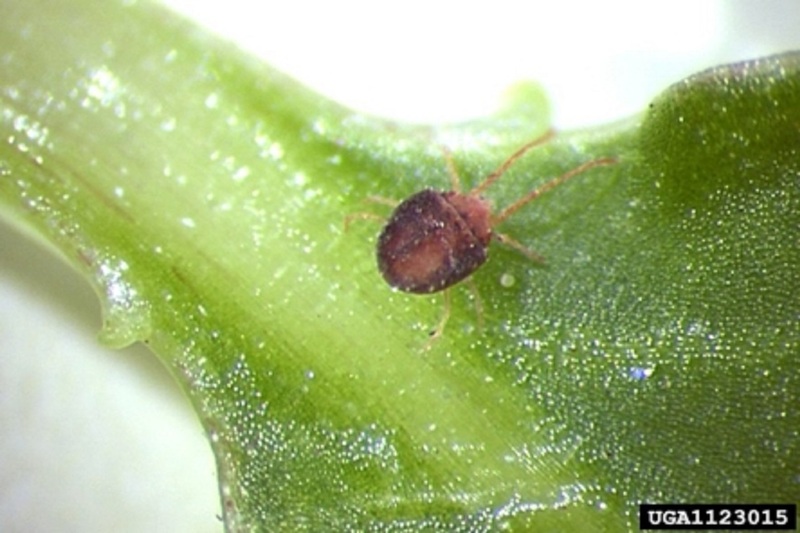 The mites resume activity and are increasingly more noticeable during periods of warm weather and rising temperatures, in winter and in early spring. They congregate in sunny areas-especially around windows-in preparation for migration to outdoor plants. This is the time that homeowners usually first notice their presence. Indoor activity reaches a peak during May and then tapers off as mites complete their migrations from the house to outdoor plants. The mites resume feeding and can produce two to six generations in a year. During adverse summer weather, such as drought, mites may migrate back to buildings until outdoor conditions improve. Mites already in homes can be eliminated by using appropriate vacuum attachment, but be careful not to crush the mites, as they will stain. The vacuum bag should also be disposed of so that the mites cannot escape back into the house. This treatment only provides temporary relief and must be repeated as new mites move out of hibernation. Grass growing next to the foundation of homes affords the mites protective cover and easy access to buildings. Flowerbeds or unplanted strips of sand or fine gravel 18 to 24 inches wide around the foundation help reduce the number of mites entering homes. Caulk all cracks and crevices in clapboards, shingles, and foundation and around basement windows. Basement windows are reported as one of the favorite hiding places for clover mites. Remove basement windows, if possible, and thoroughly clean them to remove mites and their eggs from window frames and in window channels. This can be done by first using a brush to loosen them and then picking them up with a vacuum cleaner.